The MLB introduced Rob Manfred Thursday as the new Commissioner of the MLB. Bud Selig, longtime commissioner, is retiring in January. Selig accomplished many great things during his tenure that affect the game today, like interleague play. Manfred was the most ready out of the three candidates. We ask ourselves come draft time in sports, who is the most professional ready? Well, Manfred was most ready for this spot. A sidepiece to Selig over the years, Manfred was like Adam Silver was to David Stern. But enough about Selig, Manfred has many issues he needs to table now or this Winter in San Diego. The home-plate collision rule is the number one problem in the majors right now. As we saw last week, there were four instances where the umpires were either confused or wrong. 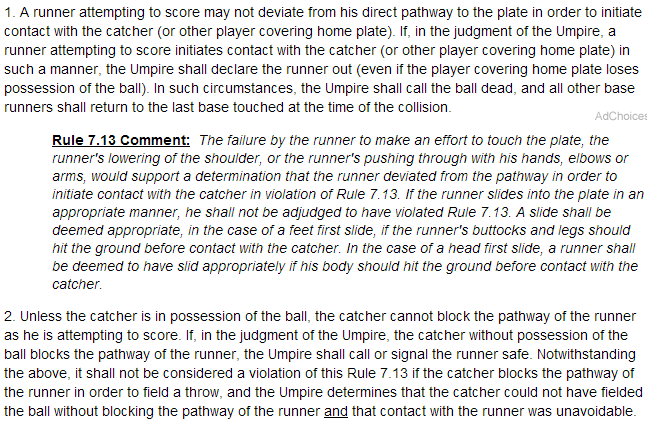 The rule is not understood by ALL the umpires in the game. The real issue is the second part. Umpires are not understanding the correct meaning of the pathway. In the video above, Tyler Flowers foot is blocking the plate. Even though Gregor Blanco never touched the plate, and Blanco was tagged, and the umpires called him safe. This is what the rule says. The umpires followed the rule. However, Ventura lost it. Why? It’s simply unfair. If the catcher isn’t allowed anywhere near the plate, how is he supposed to field the ball, and tag out the runner? It’s nearly impossible. His outrage was part defending his catcher, and the fact that the night before, almost the same play occurred. The Giants, again got the advantage, but it was opposite possession. The rule has done it’s main job, which is preventing home-plate collisions. The emphasis on the issue really came about after Buster Posey’s horrific injury a couple year ago. I believe that the confusion on this rule needs to be addressed before the playoffs. They could just abolish it until Winter, and re-due it. I don’t think it is smart to change a rule during the season, especially since this is a rule that affects the game. But then there is the counter to that, if it affects the game, then doesn’t it need attention as soon as possible? It’s a complicated issue. The other thing people need to realize is that we all knew that replay was need last season, but we went through last year’s postseason without the system that we have this season! We watched the obstruction call in Game 3 of last year’s World Series go by…. And that leads to the next issue, which is nowhere near as urgent. The new replay system this season is a massive relief. It has made the stress on umpires decrease (Umpires seem to be a common factor so far, more on that later), and it gets the calls right. It does need tweaks, though. Many of these issues overlap, like time. The length of the replays are sometimes ridiculous. Anything that is over 3 minutes is a little to much, and in a age where the goal is to make the game shorter, it needs to be addressed. I know it’s about getting the call right, but the shorter time, the better it makes it look. Again, this isn’t major, but it needs to be looked at this Winter. The next (it’s not a issue or problem) topic that Rob Manfred needs to address is the fact that baseball is fading. Ticket sales are fine, and revenue exploded during Selig’s term, so much that a salary cap isn’t needed, but the people of my generation are not interested. They care more about their twitter feed. They even play the game! They don’t watch it. Honestly, to them (not me) it’s boring. The pace of the game is simply to slow. Do I agree? Yes and no. Let’s put it this way. Sports that are more popular among my generation are football and basketball, by far. These are up-beat, fast paced sports. Action is taking place while that clock is running. Baseball, action happens every 15-20 seconds, for 5 seconds, then it stops. That’s the problem. People my age aren’t interested. And if they play the game, why aren’t they watching?! They should be watching every little thing that happens, wanting to understand more. Baseball isn’t boring. People have cared about this game before any other major sport. It just needs some more action. We can’t help that pitchers are dominating right now. It’s totally a pitchers league. Do people like hitting more than pitching? Nobody knows that! The fact is that the MLB needs to do something to speed the game up. That’s be the real issue. I have my ideas, but most of them have been floated by other personalities. This is a topic that should be tabled this Winter. It’s definitely a long-term situation. We cap this by talking about the umpires. Umpires are great, and most of them know their stuff. This gets back to the home-plate rule. We need to know that all the umpires understand the rules. It’s just a check-up. Come playoff time, the umpires need to know the details of each rule. Rob Manfred is definitely capable to tackle these issues. It’s just a matter of what is tabled when. Again, Manfred was most ready, and was probably the right choice. However, it would’eve been very interesting to see Tom Werner get the job. Werner would’eve added a prospective to the office that no other candidate would. That would be the fact that he worked, as a major figure in one of baseball’s best franchises, the Boston Red Sox. He has a prospective that no else had. He would see it through a baseball franchise’s eyes. He would make his decisions not for the Red Sox, and not benefiting them, but he would go, “How would a team feel about this?” I feel like this should of been going through the owners minds while voting. Again, Manfred was probably the right decision. Baseball’s got a bright future. Hopefully Manfred can make the right decisions and power baseball through the next 15 years. Who Should The Minnesota Vikings Start At Quarterback?